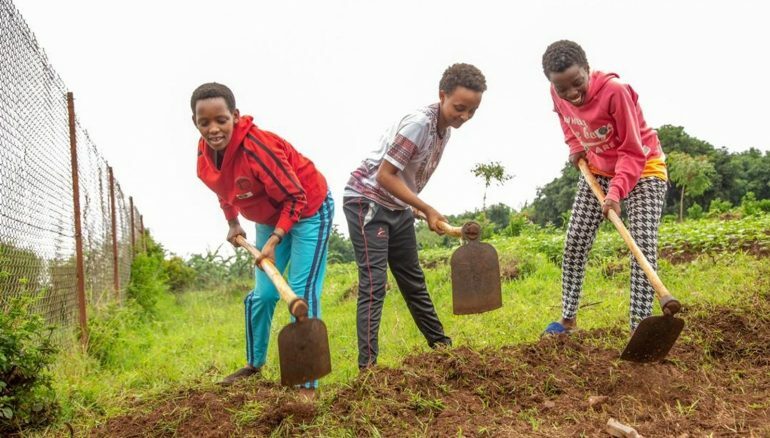 Orphaned and vulnerable youth from the Agahozo-Shalom Youth Village (ASYV) in Rwanda took part in the first international Mitzvah Day projects of 2018. ASYV helps some of the 1.2million children orphaned by the Rwandan genocide. Through healing, education and love, the facility empowers the orphaned and vulnerable youth to build lives of dignity and contribute to a better world. Taking part in Mitzvah Day for the first time, students completed a variety of projects both within ASYV and outside of it. They put on their aprons to prepare food for those need and their rubber gloves to scoop manure from a cow shed. Venturing further afield they also took their gardening equipment to improve local roads and clear up the nearby village. They were assisted by Jewish volunteers from both Britain and America. Another project will also take place in Rwanda in early November at Resonate Workshops, a charity which provides skills and education to women and girls in the country. Resonate staff, led by Jewish volunteer Ayla Schlosser, will run a free ‘Storytelling for Leadership’ workshop for female entrepreneurs. Another big advance for 2018 is in South Africa, where Mitzvah Day is partnering with Mensch – a local organisation that mobilises positive social activism based on Jewish values. Mensch Mitzvah Day events will include collectathons and ‘street stores’ to help the homeless, blood donations and an opportunity to volunteer at pet adoption days. Mitzvah Day will also once again have a strong presence in Germany and Australia, with multiple projects taking part in both countries with faith, civic and politics leaders all involved. In total 40,000 volunteers around the world will give their time not their money to help others on Mitzvah Day on, and around, Sunday November 18. Other countries hosting projects will include India, Poland and Turkey.